Please notice that even these children realize rolling down a hill will make one dizzy and disoriented. Too bad the professional school bus driver did not put this together in her “professional driving mind”. 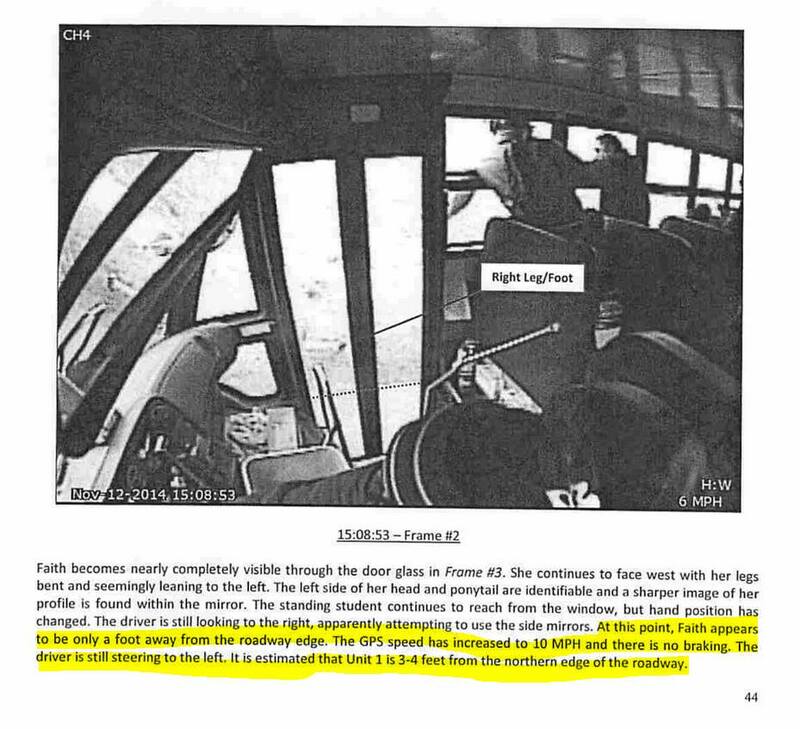 The following student notices Faith losing her balance and witnessed her “tumbling” and falling into the street, BEFORE THE BUS HIT HER AND WENT AN ADDITIONAL ALMOST 60 FEET! ALL THIS AT 6 TO 11 MPH?? Yeah she cried and felt so bad she did not even send a card or any kind of condolence to the family. I believe in hindsight she was not crying because of what she had done she was crying because she was feeling sorry for herself. She did not care about Faith or Faith’s Family and if this was just an “Accident” why did she not send her condolences then? Although she was responsible for what happened to Faith she could care less for the family as her actions showed this even after the investigation was over. In this next child’s statement they also acknowledge that rolling down the hill made Faith dizzy. They also “assume” the school bus driver did not see Faith coming towards the road disoriented. Finally a third eyewitness statement from a child that still observed that Faith was dizzy BEFORE THE BUS HIT HER! The icing on the cake, The School bus Drivers statement. Notice she admittedly says, “I NOTICED HER STUMBLING IN MY SIDE MIRROR”. Instead of stopping at 6 MPH she gassed it veered left into an oncoming lane and accelerated for an additional 60 feet!!!! She also says, “I NOTICED A GIRL ROLLING DOWN THE HILL ALONG SIDE OF ME. SHE WAS DOING THIS YESTERDAY”. Never reporting it to the school and if she did the school never reported it to us, Faith’s parents! Here is a picture that I shared before with the Ohio State Patrol’s comments underneath. 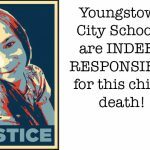 Please remember it was the officials in the City of Youngstown that do not want to press charges. In this picture we see her looking right at Faith and veering left and instead of stopping the bus she is gassing it. Going to teach this little girl a lesson for playing on the hill. I am sure that if it was her child she would of stopped that bus at all cost! In her statement she said Harley was helping her up as she was passing. What a liar! In the video evidence we see Faith getting closer and closer to the road way. Many of us when we see a dog getting closer and closer to a roadway we slow down and stop if necessary. Not this woman, Faith is nothing more than a piece of trash to her as well as all children are. She increases speed, veres left and hits her. Many of us would not even do this to a kitten or a dog. Just look at those kids standing up and hanging out the window. Yeah she really cares about the safety of our children, NOT! I also want to point out that there were vehicles behind the bus that observed what was happening the day and did stop. The fact that the bus driver saw Faith is apparent from her statement to the police. However instead of stopping and protecting her from the other vehicles behind her she veers left into an oncoming lane. Possibly hoping that if she does not hit her maybe a car behind her would. When I got to the scene minutes after the “Preventable Tragedy” there were cars stopped at least 25 to 30 feet back from the body! To me this further shows the complete negligence on the part of that horrific driver! The next time that you are in your vehicle go 6 to 10 mph and see how long it takes you to stop. You will notice that it is immediate. The fact of the matter is that this driver does not want to stop at all and she is STILL driving a school bus. She could care less about the safety of children or the horror that she brings to families and communities. Unfortunately the officials in Youngstown Ohio feel the same way she does! Omg the second student’s statement is just horrible. Just horrible. Even at this very day they have not even put so much as a sign up there telling children NOT to play on the hill. They are more than negligent at this point, they are down right dangerous to the safety of our children! Previous Previous post: Faith McCullough, why is she important to the Nation?